We was young. We just found our precious! But our friends didn't like us anymore. So we had to find safe place. Precious hadn't found the Misty Mountains yet. Once upon a time as we were traveling alone, we finds a house with no one inside it. Poor Smeagol was very cold, wet, and hungry, so we goes in. And we sees fish! Such juicy, tender fish! Smeagol was very hungry, so we tried the biggest fish first. But they ruins it! Burned it with fire. We wants our fish raw. So we goes to the second fish. But they freezes it! Fish as hard as rocks. We only has six teeth and cannot bite it. So we goes to the smallest fish. It is fresh! It is juicy! It is tasty! We eats the whole thing. Then we wanted to sit down for a bit, so we finds some chairs. 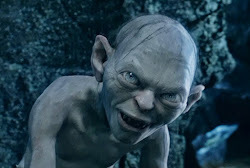 Smeagol had been starving, so we were thin, so very thin. The first chair was too big! Who would want to sit in a chair like that, we wonders? But the second chair was too big for us too! Chairs for people with more food inside them than poor Smeagol. So we goes to the third chair, and it fits! It fits us, precious! But then it breaks and Smeagol falls on the floor. Nasty, nasty chair, trying to hurt poor Smeagol. We decides to go to sleep instead. We sleep on rocks and things and almost forgot what a bed is like. When we tries the first bed we sees, it is too hard! Precious doesn't want to sleep on another rock! Gollum, gollum. Then the second bed is too soft, and we feel like we are sinking, and we doesn't like this one bit. But the third bed was just right, and since we were very, very tired, we fell asleep. But then, three nasty hobbitses came to the house. "Someone's been eating my fish," says the hobbit father. "Someone's been eating my fish," says the hobbit mother. "Someone's been eating my fish," says a very small hobbit, "and it's all gone!" Hehehehehe! It doesn't know that we eats it, my precious! Then they sees the chairs, and the father and mother hobbitses say, "someone has been sitting in my chair!" And the little hobbit says, "someone has been sitting in my chair and it's all broken!" Even though the chair hurt us! The hobbitses go into the bedroom, and the father hobbit says, "someone's been sleeping in my bed!" And the mother hobbit says, "someone's been sleeping in my bed!" And the little hobbit says "someone's been sleeping in my bed and is still there!" We wakes up and sees the nasty hobbitses. Poor Smeagol was so frightened! We runs away and never comes back. But later we wondered if hobbits were tasty. Maybe we could have stayed. All we wanted was a warm home. But we found our cave, with fishes and orcses to eat. And no nasty chairs to hurt us. It thinks this is a story about Goldilockses and bears, but they stole this story from us. Filthy thieves... Precious says always cite your sources! Don't be tricksey and false! Nice story, Smeagol, too bad they stole you're story. Hehehe! You do tell wonderful stories! Horrible chair! Obviously the workmanship was sorely lacking! Vellvin - Yes, it was a bad chair! The only chair that fits hurts us. Poor Smeagol, poor poor Smeagol. Do you have chairs in the Misty Mountains? No, no chairses. Only rocks and orcses to sit on.